(P1) Drones are entering RESTRICTED airspace and flying dangerously close to airplanes and HELICOPTERS, with the Federal AVIATION Administration (FAA) reporting hundreds of drone incidents during the past six months. (P2) Among the incidents listed in a new FAA report that runs from August 2015 to January 2016 are several reports by airline pilots of “near misses” with drones. (P3) In one incident in November, a helicopter departing the Children’s Hospital in Saint Louis had to TAKE EVASIVE ACTION to avoid a black drone. In another incident in August, a pilot flying at 7,000 feet near JFK airport reported seeing a black drone passing by in the opposite direction, a mere 20 feet to the right of the aircraft. (P4) Consumer drones have become increasingly popular , and tech companies including Intel, GoPro and Samsung are racing to CASH IN ON the trend. Amazon and Google are developing drones they hope could bring packages directly to customers’ homes. (P5) But the PROLIFERATION of drones is raising all sorts of new safety and security concerns, particularly as drones fly into parts of the sky that are subject to strict AIR TRAFFIC CONTROL systems. 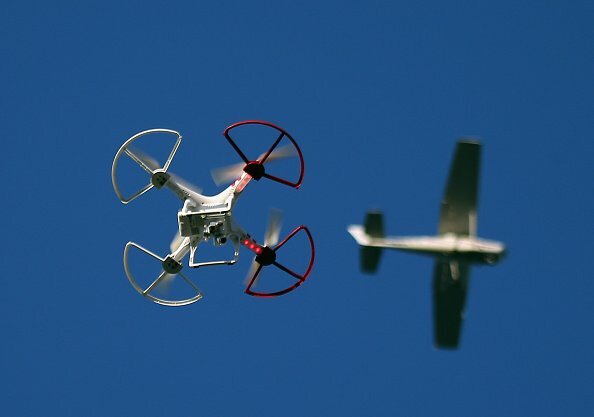 Should the use of drones be more REGULATED? Do you worry about what TERRORISTS could do with drones? Do you enjoy “tech toys”? Have you ever had a scary experience on an airplane flight?